Tim Clancy's own goal gave Rangers a late victory over Kilmarnock in the Scottish Premier League. El-Hadji Diouf struck his first league goal for Rangers to give the home side a half-time advantage. Jamie Hamill's penalty, awarded after Richard Foster's foul on Tim Clancy, drew Killie level on 61 minutes. But Clancy diverted Vladimir Weiss's cross into the net in the 87th minute and the hosts survived a late onslaught to claim all three points. The Ibrox side are now two points behind leaders Celtic, who have played a game more, while fourth-place Kilmarnock hold a two-point advantage over Dundee United, the Tangerines having two games in hand. Steven Whittaker, deployed in midfield after vacating the left-back role for Sasa Papac, was unable to direct his left-foot shot on target as Rangers probed for the opener. Killie were keen to take advantage of any European hangover suffered by the hosts following their midweek draw with PSV Eindhoven and William Gros fired a shot over the Rangers crossbar early on. David Silva was next to threaten for the visitors, curling a shot narrowly wide. There was a lethargy about the Ibrox side's play, but they almost took the lead when Diouf's corner was knocked towards goal by Kyle Bartley and Mohamadou Sissoko was well placed to clear. Diouf missed a gilt-edged chance, firing wide from six yards after Steven Davis's free-kick was diverted into his path. Kilmarnock goalkeeper Anssi Jaakkola spared Manuel Pascali's blushes when he collected the ball after the defender's clearance spun towards his own goal. Bartley headed Diouf's corner over and, at the other end, Hamill's shot spun wide of Allan McGregor's goal, the keeper restored to the Rangers line-up after being rested in midweek. Rangers' play lacked creativity and their use of the ball was at times careless, but they took the lead in the 38th minute after breaking up a Kilmarnock advance. Gros and Liam Kelly got in a muddle in the middle of the park and Rangers quickly moved the ball forward. Steven Whittaker's pass found Diouf on the right-hand side and the on-loan Blackburn player fired home from inside the penalty area. Nikica Jelavic forced Jaakkola into a save in the early stages of the second half when a pass to a team-mate may have been a better option for the Rangers striker. Rangers appeared to be happy to sit on their lead and were punished when Killie were awarded a spot-kick. Foster's high challenge on Clancy was penalised by referee Alan Muir and Hamill converted from 12 yards. The hosts went in search of the lead again and Diouf's free-kick was volleyed over by Bartley. Foster tried his luck from 25 yards, but the left-foot effort dropped over the crossbar and Davis's free-kick attempt was also too high. Rangers had two penalty claims turned down, Jelavic going down under pressure from the visiting defence before the home fans claimed the ball had struck the arm of Killie's Garry Hay. In between times, Kyle Lafferty and Weiss were sent on from the Rangers bench for the final 15 minutes, Diouf and Foster withdrawn, as manager Walter Smith looked for a fresh impetus. 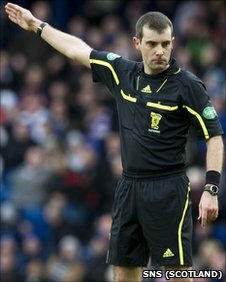 Rui Miguel, who had come on for Gros, went to ground in the Rangers box under pressure from Bartley but referee Muir again waved play on. Sissoko sustained an injury and left the field, but Kilmarnock had to wait until a break in play to send on a replacement. And while they were down to 10 men, the Ayrshire side fell behind again as Weiss's cross into a dangerous area was knocked past Jaakkola by the unfortunate Clancy. Kilmarnock went in search of a second equaliser and had further penalty appeals turned down after Lafferty collided with Clancy in the area. 90:00+3:59 The match has reached full-time. 90:00+3:04 Vladimir Weiss decides to take the corner short. 90:00+2:50 Tim Clancy crosses the ball, save by Allan McGregor. 90:00+0:27 A cross is delivered by James Fowler, Kyle Bartley manages to make a clearance. 90:00+0:07 Nikica Jelavic is flagged offside by the assistant referee. Indirect free kick taken by Garry Hay. 89:04 Nikica Jelavic concedes a free kick for a foul on James Fowler. The free kick is delivered right-footed by Jamie Hamill from right channel, Kyle Bartley makes a clearance. 89:04 Booking Nikica Jelavic goes into the book. 88:56 Booking Sasa Papac receives a yellow card for dissent. 88:30 Substitution Mohamadou Sissoko leaves the field to be replaced by Willy Aubameyang. 86:26 Assist on the goal came from Vladimir Weiss. 86:26 GOAL - Tim Clancy:Rangers 2 - 1 Kilmarnock Tim Clancy scores an own goal from 6 yards. Rangers 2-1 Kilmarnock. 84:34 A cross is delivered by Vladimir Weiss. 82:52 Steven Davis crosses the ball. The offside flag is raised against Madjid Bougherra. Anssi Jaakkola takes the indirect free kick. 81:04 David Weir produces a cross, Unfair challenge on Jamie Hamill by Maurice Edu results in a free kick. Anssi Jaakkola restarts play with the free kick. 80:56 Sasa Papac produces a cross. 80:41 Short corner taken by Vladimir Weiss from the left by-line. 80:12 Craig Bryson has an effort at goal from outside the penalty area missing to the wide left of the goal. 79:39 Corner taken short by Garry Hay. 79:13 A cross is delivered by Madjid Bougherra, blocked by Tim Clancy. 77:28 Outswinging corner taken by Steven Davis, Nikica Jelavic has a headed effort at goal from deep inside the area missing to the right of the goal. 77:20 Madjid Bougherra delivers the ball, Garry Hay gets a block in. 76:14 The assistant referee flags for offside against Madjid Bougherra. Indirect free kick taken by Anssi Jaakkola. 76:00 Madjid Bougherra produces a cross, Tim Clancy gets a block in. 74:58 Substitution Vladimir Weiss replaces Richard Foster. 74:58 Substitution Kyle Lafferty replaces El-Hadji Diouf. 74:02 Steven Whittaker fouled by Garry Hay, the ref awards a free kick. Steven Davis has a direct shot on goal from the free kick. 73:56 The ball is sent over by Madjid Bougherra, Manuel Pascali makes a clearance. 72:32 Corner taken right-footed by El-Hadji Diouf, Nikica Jelavic has a headed effort at goal from deep inside the area missing to the right of the goal. 72:02 Mohamadou Sissoko gives away a free kick for an unfair challenge on El-Hadji Diouf. The free kick is delivered right-footed by El-Hadji Diouf from left wing, clearance made by Manuel Pascali. 70:41 Shot by Maurice Edu. Craig Bryson gets a block in. Shot from just outside the box by Richard Foster goes over the target. 70:14 David Silva produces a cross, David Weir manages to make a clearance. 69:25 Unfair challenge on Craig Bryson by Steven Davis results in a free kick. Liam Kelly takes the free kick. 67:05 Madjid Bougherra gives away a free kick for an unfair challenge on Garry Hay. Anssi Jaakkola takes the direct free kick. 67:05 Booking Booking for Manuel Pascali. Correction - 66:13 The ball is crossed by Nikica Jelavic, James Fowler manages to make a clearance. 66:13 The ball is delivered by Nikica Jelavic, clearance by Craig Bryson. 65:40 Sasa Papac crosses the ball, clearance by James Fowler. 64:26 Free kick awarded for a foul by David Silva on El-Hadji Diouf. The ball is sent over by El-Hadji Diouf, Close range strike by Kyle Bartley goes over the bar. 63:31 The assistant referee signals for offside against Jamie Hamill. Allan McGregor takes the free kick. 61:17 Madjid Bougherra produces a cross, El-Hadji Diouf concedes a free kick for a foul on Manuel Pascali. Direct free kick taken by Anssi Jaakkola. 60:02 Substitution Rui Miguel joins the action as a substitute, replacing William Gros. 60:02 Booking Richard Foster is cautioned by the ref for dissent. 60:01 Foul by Richard Foster on Tim Clancy, Penalty awarded. 60:01 GOAL - Jamie Hamill:Rangers 1 - 1 Kilmarnock Penalty scored by Jamie Hamill. Rangers 1-1 Kilmarnock. 57:21 The ball is delivered by Richard Foster, El-Hadji Diouf takes a shot. Anssi Jaakkola makes a comfortable save. 55:25 El-Hadji Diouf fouled by Jamie Hamill, the ref awards a free kick. Kyle Bartley takes the free kick. 54:18 Jamie Hamill sends in a cross. 53:21 Nikica Jelavic concedes a free kick for a foul on Manuel Pascali. Anssi Jaakkola takes the direct free kick. 52:41 Unfair challenge on Liam Kelly by Maurice Edu results in a free kick. Jamie Hamill restarts play with the free kick. 50:56 Free kick awarded for an unfair challenge on Madjid Bougherra by Garry Hay. El-Hadji Diouf delivers the ball, Nikica Jelavic produces a header from inside the area that goes over the crossbar. 50:56 Booking Garry Hay booked. 49:26 Foul by Madjid Bougherra on Garry Hay, free kick awarded. David Silva crosses the ball in from the free kick, Madjid Bougherra makes a clearance. 48:36 Nikica Jelavic takes a shot. Save by Anssi Jaakkola. 45:00+0:13 The match has reached half-time. 43:06 Madjid Bougherra crosses the ball, save by Anssi Jaakkola. 42:13 Shot by Steven Whittaker from 25 yards. Blocked by Garry Hay. 41:48 Richard Foster sends in a cross. 41:01 Free kick awarded for an unfair challenge on Madjid Bougherra by James Fowler. Direct strike on goal from the free kick comes in from Steven Whittaker, Mohamadou Sissoko gets a block in. 37:47 The assist for the goal came from Steven Whittaker. 37:47 GOAL - El-Hadji Diouf:Rangers 1 - 0 Kilmarnock El-Hadji Diouf fires in a goal from inside the area to the bottom left corner of the goal. Rangers 1-0 Kilmarnock. 35:14 Free kick awarded for an unfair challenge on Garry Hay by Maurice Edu. Craig Bryson takes the direct free kick. 34:29 A cross is delivered by Madjid Bougherra, Anssi Jaakkola makes a save. 33:20 Tim Clancy gives away a free kick for an unfair challenge on Richard Foster. Centre by Steven Davis, Nikica Jelavic takes a shot. David Weir gets a block in. 32:14 James Fowler fouled by El-Hadji Diouf, the ref awards a free kick. Direct free kick taken by Jamie Hamill. 31:48 Jamie Hamill has an effort at goal from outside the box which goes wide right of the target. 30:39 Corner taken by El-Hadji Diouf from the right by-line played to the near post, Header from deep inside the area by Kyle Bartley goes over the bar. 30:33 Richard Foster crosses the ball, Tim Clancy gets a block in. 30:17 David Silva concedes a free kick for a foul on Maurice Edu. Direct free kick taken by David Weir. 29:58 Jamie Hamill produces a cross. 29:46 Foul by Steven Davis on Craig Bryson, free kick awarded. Craig Bryson takes the free kick. 28:27 The referee blows for offside against Sasa Papac. Jamie Hamill restarts play with the free kick. 26:32 Madjid Bougherra produces a cross. 24:47 The official flags William Gros offside. Free kick taken by David Weir. 23:09 Tim Clancy gives away a free kick for an unfair challenge on El-Hadji Diouf. Steven Davis restarts play with the free kick. 22:56 The ball is sent over by Jamie Hamill, Madjid Bougherra manages to make a clearance. 22:07 Free kick awarded for an unfair challenge on David Silva by Madjid Bougherra. Craig Bryson restarts play with the free kick. 21:34 Madjid Bougherra delivers the ball, Manuel Pascali manages to make a clearance. 20:53 Free kick awarded for a foul by David Silva on Maurice Edu. Free kick taken by Kyle Bartley. 18:35 Manuel Pascali concedes a free kick for a foul on Nikica Jelavic. Steven Davis fires a strike on goal direct from the free kick. El-Hadji Diouf produces a left-footed shot from deep inside the six-yard box which goes wide of the left-hand post. 18:24 Sasa Papac delivers the ball. 18:17 The ball is crossed by El-Hadji Diouf, blocked by Jamie Hamill. 16:44 The ball is sent over by Sasa Papac, James Fowler makes a clearance. 16:15 Outswinging corner taken from the right by-line by El-Hadji Diouf, Mohamadou Sissoko makes a clearance. 15:41 El-Hadji Diouf takes a outswinging corner to the near post, Kyle Bartley takes a shot. Clearance by Mohamadou Sissoko. 15:35 The ball is crossed by Richard Foster, blocked by David Silva. 14:45 The ball is delivered by Garry Hay, Effort on goal by Liam Kelly from just inside the area clears the crossbar. 14:19 James Fowler is adjudged to have handled the ball. Steven Davis takes the free kick. 13:45 Steven Whittaker has an effort at goal from outside the box missing to the wide left of the goal. 10:42 The ball is sent over by Liam Kelly, clearance made by David Weir. 9:20 The ball is crossed by Madjid Bougherra, save made by Anssi Jaakkola. 9:10 Nikica Jelavic sends in a cross. 8:50 David Silva produces a left-footed shot from just outside the box that misses to the right of the target. 8:18 Outswinging corner taken by Jamie Hamill from the right by-line. 8:03 Liam Kelly sends in a cross, David Weir gets a block in. 6:56 William Gros takes a long range shot harmlessly clearing the crossbar. 5:18 Steven Whittaker crosses the ball, clearance made by Manuel Pascali. 1:38 Corner from the left by-line taken by Garry Hay, clearance made by Madjid Bougherra. Correction - 0:45 The referee blows for offside. Free kick taken by Anssi Jaakkola. The ball is crossed by Madjid Bougherra, Steven Whittaker takes a shot. 0:45 Madjid Bougherra produces a cross. The assistant referee signals for offside against El-Hadji Diouf. Indirect free kick taken by Anssi Jaakkola.